Variegated Pink ribbonwork flower with pink bud and variegated green picot ribbon for leaves. 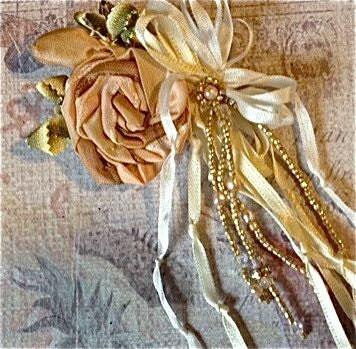 I so love all the wonderful ribbon work from the turn of the century thru the 1920's and 30's. So much of the wedding ribbonwork had these flowing cascades of knotted silk and satin ribbon with twisted roses and buds. 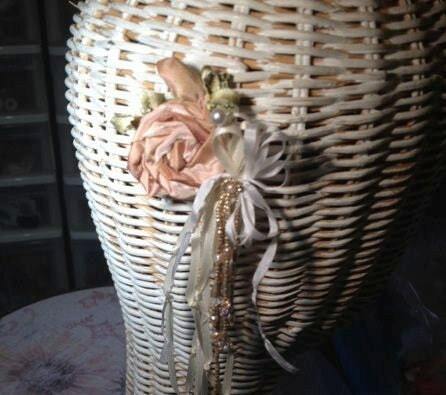 I added the vintage seed beads, crystals and pearls. It all seemed to fit perfectly. Can be worn on a dress, a sash, would be beautiful on a lace bolero style shrug or sweater. 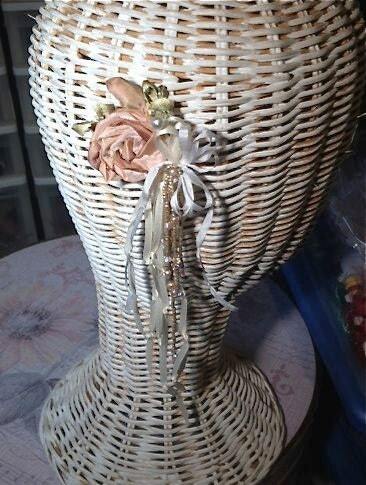 Put it on your garter or use it with the bridal veil. So many options. Each one better than the last. Ribbons, ribbons and more ribbons. There can never be too many for me. 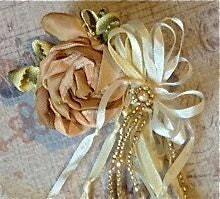 I have a passion, an obsession really, for beautiful ribbon flowers. My mentor, Ruthie Konakauff, a brilliant ribbon artist, shared with me her passion for ribbon over thirty years ago, and I have been fascinated ever since. The rules never change despite the passing fashion trends. Beautiful, is always beautiful. You will consistently find flowers in fashion from Biblical to High Couture and Goth. 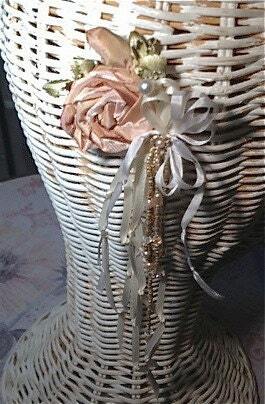 The ribbon flowers offered here are my effort to satisfy my need to create ribbonwork blooms that will find their home anywhere within a Romantic Victorian style or the current industrialized Steampunk/Goth genre. Use your imagination. Fantasy is what you make it.